Just launched a storefront for prints of my work. 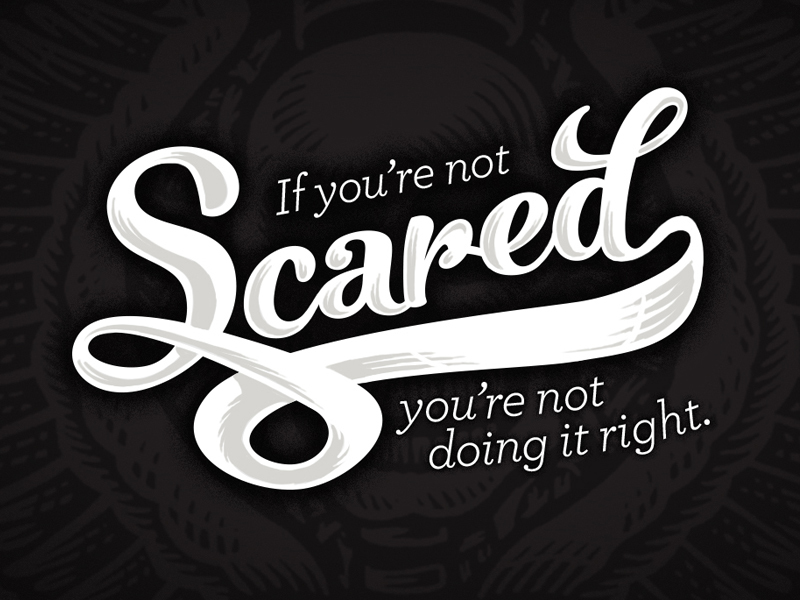 If you’re not scared, you’re not doing it right. Last weekend I got the honor of speaking at Phoenix Design Week (http://www.phdw.com) – an inspirational weeklong celebration of design and creativity here in the hot zone that is Arizona. My presentation was about the value of being scared. I define scared a little differently than most people – to me it’s a state of nervous anticipation and excitement – kinda like waiting to go into a haunted house – you’re anxious, but you’re sure as hell going in. This is very different from fear, which I view as a state of paralysis – where you’re frozen and unable to move. Every time I’ve done something truly worthwhile, I’ve been scared. Lost sleep, panicked over my soon-to-be-ruined reputation and stressed over disappointing the clients who gave me their trust (and money). That horrid anxiety pushed me to excel. to exceed my limitations and truly commit to the task at hand. In the end, I’d look back at that beginning moment and realize it was necessary (for me at least) to force me upward. The other thing about these moments is they’re not crazy leaps of faith. I’m not foolish enough to act that way – I believe you succeed in a creative business through your reputation & results – and that’s it. If you miss deadlines, promise and don’t deliver or produce bad work, it just simply goes away. And seldom comes back. So I hedge my bets. I observe the world around me until I find something I want to learn. I experiment with it and see if I have any aptitude for it. If so, then I focus on it and learn it to the best of my ability. Once I’ve done that, I’m ready to get scared – I commit to the endeavor and work like Hell to execute it. Once I’ve done that, there’s no longer a fear of doing it, just the challenge to improve on it the next time I get the chance. Still scared of course, but with a tad bit more confidence. Here’s to being scared, but never afraid. Built two of these over the last couple weekends to house the patron saint illustrations when they’re complete – got to channel my Grandfather on this one – he was a great woodworker. New series getting started – had visited a museum at the University of Arizona with my wife and daughter and saw some great renaissance paintings of saints. The visual framing of them in small niches was really cool as was the very vertical feel to them – so I decided to apply that look to a series of illustrations featuring the patron saints of my kids. I’m a huge fan of iconography in religion so these will be great to do and add in some subtle elements.